Graves of Australian soldiers buried in the Cairo War Memorial Cemetery. The central grave, marked with a large cross, is that of 390 Sergeant (Sgt) Norman Lambert Fox, 9th Battalion, of Rockhampton, Qld. Sgt Fox was killed by the explosion of a bomb at Zeitoun near Cairo on 18 February 1916, aged 25. On the left foreground is the grave of 2458 Private [Pte] Norman Edwin Pike, 2nd Battalion, of Rozelle, NSW who died of sickness on 20 February 1916. 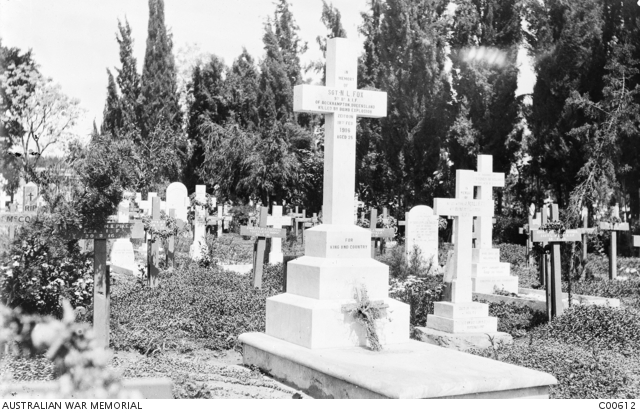 In the centre of the image behind the large cross in the foreground is the small wooden cross on the grave of of 1380 Private Harold Stanley Freeman, 9th Australian Light Horse Regiment, born in Adelaide, SA, who died of meningitis and a fractured skull on 30 January 1916. To the right centre background (partially obscured by Fox’s cross) is the grave of 76 Pte James John Berry, 23rd Battalion, of Upper Beaconsfield, Vic. Born in Canterbury, England, Pte Berry died of pneumonia on 29 January 1916, aged 20. The white stone cross (right foreground) marks the grave of 1254 Trooper John Mallet, 11th Australian Light Horse of Alpha, Qld, who died on 18 February 1916. To the right and behind Mallet’s cross is another white cross, marking the grave of 1226 Driver (Dvr) Sydney Whitaker Holmes, 7 Company, Australian Army Service Corps, 1st Divisional Train. From Five Dock, NSW, Dvr Holmes died of enteric (intestinal) fever at Heliopolis on 29 January 1916.